My Rating: A must-read for everyone willing to learn about this devastating hereditary blood disorder. No matter how much you think you know, or don’t know, about Sickle Cell Disease, this book will give you a perspective you cannot have aside from having the disease yourself or knowing well someone who does. There are still many misconceptions about it and much misunderstanding. Ms. Jones has opened her heart and invited the reader into her life, the good and the bad. In a personable writing style she tells in an honest way about her upbringing in a large family that had little understanding of how to deal with Sickle Cell Disease – the sorrows, the heartaches, the chronic pain and suffering, the dashed hopes and dreams of a child. Many times she could have given up, could have despaired and not tried again, but being a determined and insightful person of faith she fought her way through everything that stood in her way. She is still fighting, but now it is not only for her own life but for the benefit of others afflicted with the devastating blood disorder that is, as yet, incurable. Starting with her earliest memory at age four, she very visually relates her story, easily pulling the reader into each scene. You will learn about her dysfunctional family life and the prejudice she suffered at school even when she was an achiever, the inadequate medical treatment she received due to lack of understanding about Sickle Cell Disease, her brushes with death, her determination to make a success of her life as she struggled through adolescence and into adulthood with the knowledge that she would probably die young. And you will walk with the author, hoping for her through each chapter as you learn what life is like for those born with the disease. You will feel frustration because of misinformation and then satisfaction as this brave woman continues to strive to spread awareness of Sickle Cell Disease, how to treat it, and how to live with it. is found in many races throughout the world? has been reported in twenty countries, and of those only a few have the needed care programs? has a life expectancy of 42 for males, 48 for females? is not contagious but is a genetic disease that causes terrible physical pain and complications and must be managed very carefully? is not yet taken seriously enough to be funded responsibly nor studied enough to make a significant difference for the people who live with it all their lives? is easily detected with a blood test that will show if a person has the disease or is a carrier? 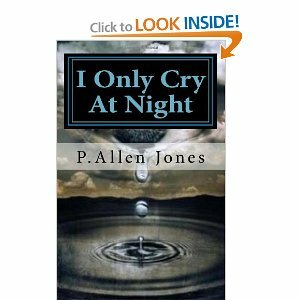 P. Allen Jones, a Sickle Cell Disease advocate, has written a book that is well worth reading. In this book she not only shares how this disease has affected her own personal life and how she had to learn to cope with it in all areas of life, but having done a great deal of research she has included valuable information with disturbing statistics. One negative note: the first printing of her book was a frustrating disappointment to the author because of the poor editing. If you happen to obtain a copy of the first edition and can overlook the common errors that should have been picked up in editing, then do read the book for its message. There is now an improved second printing. Even if you get a first edition you will not miss the author’s sincere voice; it is strong and clear and real. You will be much better informed for having read I Only Cry At Night: Living With Sickle Cell Disease. Visit www.pallenjones.com for where to purchase her book, and for locations of her scheduled book signings and talks. You can find I Only Cry at Night: Living With Sickle Cell Disease listed on my BUY THE BOOK! page.